The imagination and artistry on display in the animated shorts I've seen recently (The Cathedral, No Corras Tanto) had me chomping at the bit to check out a few more, and after reading the premise for 2003's Das Rad, I knew I couldn't let another day pass without watching it. 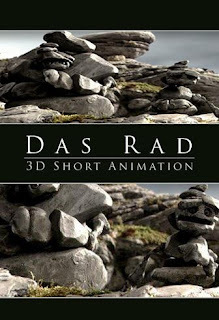 Produced by the Film Academy of Baden-Württemberg, Das Rad (released as "Rocks" in the U.S.) combines stop-motion with CGI to tell the story of two rocks, Hew and Kew (voiced by Rainer Basedow and Michael Habeck), who, from their perch high atop a mountain, watch the entirety of human history unfold before their eyes. At first amazed by what they see, the duo is soon threatened by mankind's "progress", which does a whole lot more than just change the landscape in the valley below. Das Rad is, at times, quite funny (Hew, the larger of the two rocks, spends several millenia dealing with an algae "rash"), but the most impressive thing about this 9-minute short (aside form the animation, which is phenomenal) is the way it handles the passage of time. A moment to Hew and Kew equates to dozens, if not hundreds, of years in the earth's evolutionary process. Things move so quickly, in fact, that the progress they witness is often a blur. Conversely, on two separate occasions, we spend time with human characters, first a primitive caveman, then a merchant who, while traveling on a dirt path that runs alongside the rocks, breaks one of the wooden wheels on his cart. After changing it, he tosses the damaged wheel aside, leading to what I consider to be the film's most interesting scene (after finding the broken wheel, Kew realizes man has mastered transportation, but before he can turn and show the evidence to Hew, so much time passes that the wheel turns to dust in his hands). Das Rad received a nod for Best Animated Short at the 75th Annual Academy Awards in 2003, putting it in some very good company (aside from Poland's The Cathedral, Pixar's Mike's New Car, a follow-up to Monster's Inc., was also nominated). And even though Das Rad didn't win (the award that year was given to The ChubbChubbs), it was more than deserving of the recognition.